BMW’s luxury flagship sails into 2012 with no changes after a momentous 2011 that saw new trim levels added to the lineup. With those additions, the 7 Series stable is starting to look as confusing as the 911’s, with four engines and cross-model options of rear and all-wheel drive as well as two wheelbase lengths. Starting at the bottom are the 740i and Li, with the “L” denoting the longer 205.3-inch wheelbase as opposed to the i’s 199.8-inch length. Here you’ll get a 3.0-liter inline 6-cylinder (I6) engine that’s been fitted with twin turbochargers and direct injection for a healthy 315 hp. This is the first time a 6-cylinder engine has been seen in a 7 Series on these shores since 1992. Here they’ve upped the boost on the engine’s turbos from previous 3 Series applications for 10.2 psi. While the 740 offers the smallest engine of the lineup, it’s no slug, and it’s the only 7 Series offering that can boast a dead-even 50/50 weight distribution. It can also boast a pricetag more than 10 grand less than its brethren, and that’s a big difference. However for those looking at a 7 Series, prestige is definitely a concern. More cylinders means more power, and more power is a sure way to more prestige. To that end, the 750i and Li get the 4.4-liter, twin-turbocharged, direct-injected V8 first seen in the X6. It’s good for 400 horses and will push the nearly 4,500-pound 7 Series to 60 mph in just over 5 seconds according to BMW. Like the 3.0 in the 740s, the 4.4 has been geared and tuned for a more relaxed launch and cruise manner, with its monstrous power arriving later in the powerband. Lay off the accelerator, and you’d never know the demons that lurk just under the hood. For the truly power mad, there’s the option of the 6.0-liter twin-turbo V12 in the 760Li, which delivers an incredible 544 hp and comes mated to an 8-speed automatic, as opposed to the 6-speed in the lower trims. While 544 hp are daunting, more impressive are the 553 lb-ft of torque ready to tear the road out from underneath you at just 1,500 rpm. Less impressive is the gas mileage: just 13 mpg city/19 highway. But then even the 3.0-liter can manage only 17/25, with the 4.4 sitting square in the middle at 15/22, all on premium fuel. Of course, 7 Series buyers aren’t usually all that concerned with economy. Technology and comfort are higher on the list, and the 7 Series does deliver. Even better, it manages to do so without the complications the iDrive system previously had. While improvements can still be made – separate audio controls please, BMW? – changes that now offer simple climate control and suspension changes independent of the joystick are very welcome. In the same category, moving the gearshift back to the center console as opposed to off the steering wheel has been universally applauded among buyers and reviewers. It’s a small change but looks cleaner and feels sportier. Small changes count for a lot. Handling is predictably among the best in the class, meeting or beating all competition. However, for the 6-figure price tag, many feel as though it could be more comfortable, as is its main rival, the Mercedes S-Class. It’s a simple comparison, though: For more sport, go for the BMW; for a road couch, go for the Mercedes. Choosing suspension settings between Normal, Comfort, Sport and Sport+ modes will change things quite a bit, going from lazy to crazy, but even Comfort mode can transfer too much road information at times. However, fitted with the optional Active Roll Stabilization and Integral Active Steering in the Sport Package, the 7 Series is quite agile for such a large car, and it certainly never wants for power regardless of engine. For drivers who still want a bit more, Alpina has turned its attention to the 7 Series and created the B7. They’ve taken the 4.4-liter V8 and fitted larger turbos and reinforced cylinder heads with new pistons to handle the extra boost – 14.5 psi max. This means a power bump to 500 hp and 516 lb-ft of torque down at only 3,000 rpm. It also means extra heat, so there are a wealth of new radiators, oil coolers, intercoolers and other cooling upgrades throughout, including new fans and water lines. To handle the extra power, the 6-speed automatic has been reinforced, as well as the drive and half-shafts, and the aluminum differential case has been replaced by a beefier iron version. Making sure not to flex the chassis too much with this extra oomph, the spring rates are increased by nearly 20 percent, and the front and rear ride height are dropped by .6 and .4 inches. Brakes are upgraded as well with the largest BMW offers – stolen from the High Security bulletproof protection packages offered on the 750 and 760. They sit behind unique 21-inch wheels, as opposed to the 18- and 19-inch units used on the rest of the lineup, and the B7 of course gets unique styling upgrades to set it apart. Changes are coming soon, but not soon enough for the 7 Series. While a refresh may be seen in a year or two, a full redesign isn’t slated until 2015 or 2016, while the S Class could present something new as early as next year. Something to consider, but if performance driving is more to your liking from your luxury car, the 7 Series is a better bet regardless. What's your take on the 2012 BMW 7 Series? Derrick I would say it's #1 of course. Users ranked 2012 BMW 7 Series against other cars which they drove/owned. Each ranking was based on 9 categories. Here is the summary of top rankings. 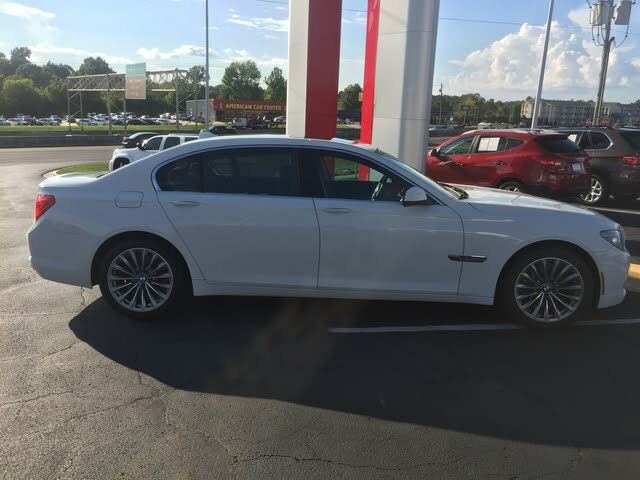 Have you driven a 2012 BMW 7 Series? Are There Differences Between A US 750i And A 750i Sold In Canada? I purchased a 750i here in the US. It was originally from Canada, so some websites have issue with the VIN. Where there any model differences between one produced for the US vs Canada?